We don't know who's pictured with actor Harry Carey at his Saugus ranch. If it's his only daughter Ella (aka Cappy), born in November 1923, this photograph would date to around 1930. This is 1926 or 1927, prior to the St. Francis Dam Disaster of March 1928, which wiped out the foliage that's seen here. 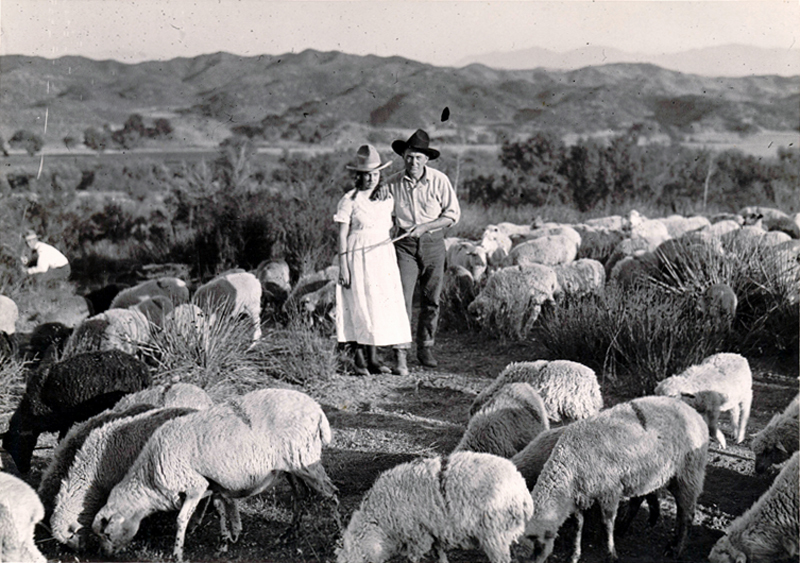 This photo is sans caption, but Dobe (Harry Carey Jr.) wrote captions on the back of similiar photos, in which he identified the sheep as "Navajo sheep," an apparent reference to the Natajo workers who lived at the ranch until about one month prior to the dam break. They didn't come back afterward. Dobe also identified similar photographs as 1926 or 1927. DC3004a: 9600 dpi jpeg from original print courtesy of Harry Carey Jr.